Nathan Kulpa, a 2015 graduate of the NMC-MSU plant science program, will tell you the answer is D. But on the eve of Thanksgiving, the traditional culmination of the growing season, the Leelanau County native is sanguine about his first year as the farm manger of Peninsula Farms. Brian Matchett is the coordinator of the program, which offers students an NMC degree plus an MSU certificate in one of four agriculture specialties. While the weather dealt growers a “triple whammy” this year, Matchett said that on the positive side, vegetable production was minimally affected. Also, the network of markets for growers — farmers’ markets, distributors like Cherry Capital Foods and CSAs — all continued to expand. So are the options in the plant science program. Since Matchett took over in 2013, he’s restructured and updated the curriculum, adding more required courses to some areas and allowing more elective flexibility in others. All of the changes were made based on feedback from the agriculture industry, which provides one in every five jobs in Michigan. 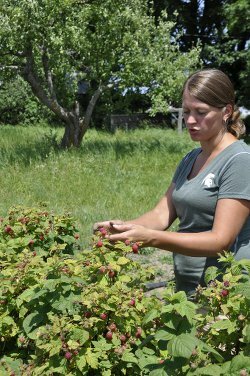 Bethany Newell is enrolled in fruit and vegetable production, one of the redesigned certificates, and worked at two different CSAs over the summer. She’ll graduate next spring, completing a lifestyle change her family embarked on in 2010 when they moved north from Flushing, where she worked in the cable industry for ten years. Next up for the plant science program is a new certificate in agriculture operations-crop production, and a partnership with NMC’s Aviation Division that will enable plant science students to take unmanned aerial systems courses as electives. 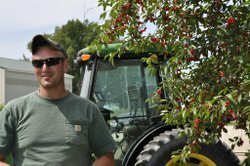 Their “classroom” would be the cherry orchards of the Horticultural Research Station that MSU operates in Leelanau County. Matchett says it’s a chance to pioneer the emerging technology of unmanned systems in a new application – specialty agriculture. Key to making it happen was the redesign of Matchett’s job, from a half-time position funded by MSU to full-time funded jointly by MSU and NMC.